This is a well-known evergreen shrub growing 1-3 meter tall, with stout sparsely branched stems. It has an undeniable architectural quality and is very hardy, despite its origins. It is a great back-of-the-border plant, making a rich background for bright border perennials. 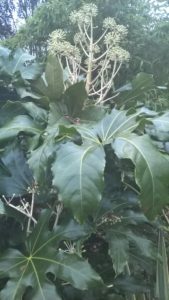 In the wildlife garden, Fatsia japonica is a must, providing extra nectar to the pollinators in the late autumn months. January is a bit late for its appreciation, but, with the recent mild winters we are experiencing, the plants are usually in good nick in mid-winter too. Severe frosts will give the leaves a glazed, pendulous look. It can look terminal but it is not. The foliage usually recovers well as soon as temperatures rise. Fatsia japonica is preferably cultivated away from full sun. When pruned like a single-trunked tree, plants are quite impressive and resemble papayas to some degree. The best effect though is probably when the plants are kept as a multi-stemmed shrub, with the branches carefully “lifted”. The name is the Latinisation of the Japanese fatsi, meaning “eight”. This refers to the eight leaf lobes. In Japan, the plant is known as yatsude (i.e. “eight fingers”). Many cultivars have been selected over the centuries, in Japan as well as in the West. One of the most impressive is F.j ‘Spider’s Web’ with a very distinctive variegation of leaves.